Excerpts of this article first appeared on Sweet Defeat. When it comes to achieving your weight loss goals, it’s obvious that both diet and exercise are important parts of the equation. But when it comes to changing your dietary habits to lose weight, there’s conflicting advice about the best approach. There’s certainly no shortage of methods to choose from— low-fat, low-carb, high-protein, or simply low-calorie— to name a few. But evidence suggests that optimal weight management is more than merely “calories in, calories out”, for this formula fails to consider the impact of insulin on total energy expenditure (or how we burn the calories we consume). Carbs serve as the body’s immediate energy source for fueling muscle contraction and other bodily functions. After you eat them, your body breaks carbs down into a type of sugar known as glucose. Insulin serves as a gatekeeper for blood sugar (in the form of glucose) to enter your cells and be used as energy. When we haven’t eaten carbs, there is very little glucose in the blood and, thus, no need for insulin. So in this state, insulin levels are low, and the body receives signals to burn stored body fat as energy. This state is supportive of weight loss. When we eat carbs, insulin levels rise to allow glucose to enter cells. What’s not so obvious about the presence of insulin is that when insulin levels are high, it tells the body to retain stored body fat. In other words, your body does not burn stored body fat when insulin is present. Emerging evidence suggests that excessive weight gain is primarily driven by elevated insulin levels. In fact, in diabetic patients who require insulin injections to control the amount of glucose in their blood, the more insulin they receive, the more obese they become. When you look closely at the relationship between glucose, insulin, and stored body fat, it becomes more clear that sugar intake (particularly refined sugar) needs to be considered in your weight loss goals. To get your weight loss goals back on track, consider incorporating some of the below tips to limit excessive sugar intake (and associated insulin levels) into your weight loss plan. Over time, as your body gets accustomed to less sugar, you’ll start to see your sugar cravings diminish. 1. Replace sugary beverages with water. Avoiding sugar is something that adults on diets often aim to do, and many switch to artificial sweeteners as an alternative. While they may be calorie-free, artificial sweeteners and sugar substitutes can be up to 600 times sweeter than regular sugar, which means your brain thinks you are consuming enormous amounts of sugar at one time. This strategy often leads to you having intense sugar cravings throughout the day. Further, there is mixed evidence on the impact of artificial sweeteners on insulin levels, and so it’s difficult to determine their impact on fat storage and weight gain. If you are serious about reducing the impact of sugar on your weight loss goals, you should pay attention to how much sugar is in the fruit you’re eating. Of course, the vitamins and nutrients in fruit are healthy for you. But because of fruit’s natural sugar content, fruit should be eaten in moderation when trying to manage weight. Consider limiting your fruit intake to 2-3 pieces per day. 5. Limit jams, jellies, honey, or other preserves. Simple breakfasts can easily be sweetened by jams, jellies, honey, and other sweet options. Be mindful of these sources of sugar, as they may be easy to forget— and count them toward your overall daily sugar consumption. One amazing way to cut back on sugar and to fight some of the associated sugar cravings is to consider getting a little help. 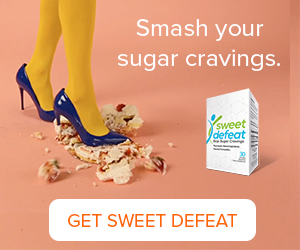 I was surprised to learn that there are lozenges made by Sweet Defeat that help fight sugar cravings so that you can effectively eliminate sugar from your diet. 8. Get used to reading grocery labels. Not all sugar is created equally and it’s important to know the difference between natural vs added sugar. There are a lot of healthy benefits in many foods that contain natural sugars, and so you’ll want to retain these in your diet. Instead, focus on limiting added sugars that are refined or processed, as this can help you move closer to you weight loss goals. Weight loss is a journey, not a destination. Simply put, this means that long-lasting weight management usually require a lifestyle change. Consider the tips below as some of the most effective ways to make your weight loss journey a success. One way to boost your weight loss success is to adjust your exercise routine. Many adults hit the gym, perform endless amounts of cardio exercise day after day, only to see minimal results. To turn up your body’s fat-burning power, consider high-intensity interval training (HIIT) workouts like this one for better results. One of the biggest issues with weight loss is that adults go all-out at the gym, only to lose all of the benefits directly afterwards. Studies have shown that sitting for long periods of time can lead to weight gain, suggesting that changing this habit may help with n your weight loss goals. For best results, regularly take standing breaks throughout your day to avoid sitting for longer than 30-60 minutes at a time. Another factor that adults should watch when attempting to lose weight is alcohol consumption. Alcohol may have some health benefits, but consuming it often can lead to increased fat production as well as inflammation. Consider limiting alcohol in your diet any time you are looking to lose weight. Make a habit out of walking. One effective way to control your body weight is to take a brisk walk after each meal. Research has shown that brisk walking after a meal for about 15-45 minutes can lead to an improvement in overall glycemic control in older adults. An improvement in glycemic control could cause better usage of insulin, which could lead to a reduction of fat in your body. If you want to more effectively lose weight, consider the impact of your sugar consumption on your overall weight loss goals. There are lots of small, healthy changes that can help limit your sugar consumption and get you on the fast track towards achieving your weight loss goals! Start making healthy changes today by signing up for your free 21-day healthy habit challenge! Thanks so much Jim… I really appreciate your feedback and am so glad you are enjoying my posts! You can contact me with any follow-up questions through the contact form tab or via email at jumaah@mindyourdamnfitness.com.